The search for the perfect muffin is one of my constants—not to make myself, that’s easy, and made easier with the Thermomix, but for that moment when the need hits, generally after a very early start to the day when breakfast has been a quick cup of coffee while dashing out the door. The search is generally fruitless, with so many cafes preferring to buy in muffins that are tall and fat and flavourless, which is perhaps why Seinfeld’s Kramer looked to start up a business based on only the crunchy tops—a pursuit that came to nothing, the essence of the series—classic Kramer. Those cafes that make their own, using the best fruit (or savoury) additions, while keeping the muffins short and squat (this is a case of [small] size does matter), can also be marked up in other areas: this effort and respect shows they care about the detail. We also prefer to have the fruit as a major player in the mix, rather than a bit player, as the photo below shows. 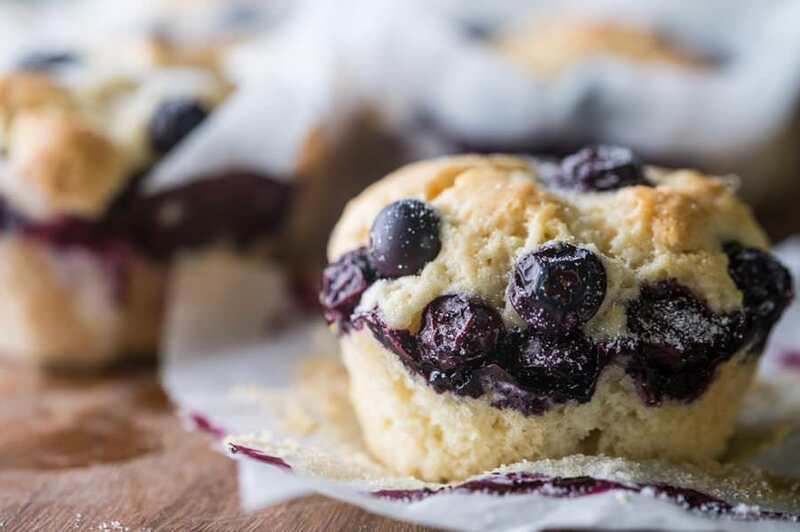 In a sneak preview of the summer edition for newsletter subscribers, we’ve included Lesley Russell’s blueberry muffin recipe. Lesley points out that, although we’ve used blueberries in this dish, pretty much anything goes; mixes of spice and berries and poached apples or pears are classics.